Now here’s a very interesting piece that we recently created for a customer in Wimborne, Dorset. This piece is a fantastic example of how our fused glass art interacts with light, which is one of the things we love most about the glass we work with. There are many things that make our products unique even among other glass decorations, but this particular panel shows exactly why this might just be our very favourite one. The design itself utilises a beautiful range of blue colours to create a very aquatic image, with soft gradients beautifully depicting different depths and layers of the water. 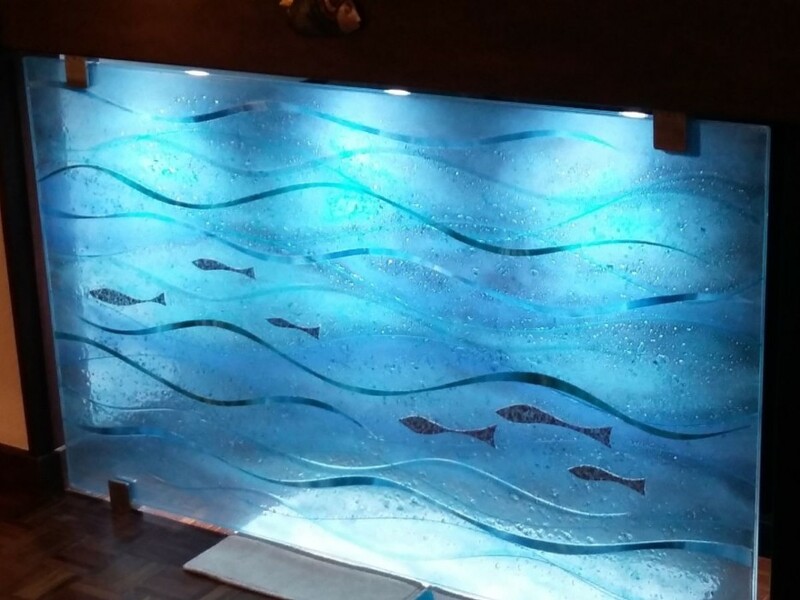 Wave shapes cut out of more opaque glass create a strong sense of contrast, introducing a new dynamic and a texture that you can actually reach out and feel for yourself, and there are plenty of fish to be seen making their way along the currents below. When the light shines through the piece, the result is absolutely spectacular! Of course, all of our fused glass art takes on a new life when you introduce it to light, but this piece was specifically made just for that effect. The panel was thin and crafted with translucent colours so that it would look perfect when illuminated, and it was centred around the lights that sat installed above it. When everything was put in place and the switch was turned on, the end result looked just like we’d hoped. The client was thrilled! Here at The House of Ugly Fish, we love creating interesting pieces of glass just like this one, and it’s always a pleasure to see our customers’ ideas come fresh out of the kiln. Make sure you don’t wait to get in contact as soon as you can. You can find our full details right here on our website, and reaching us really is as easy as picking up the phone or just dropping us an email. There’s never been a better time to invest in fused glass art, so we look forward to hearing from you.